Our guide to US poker sites looks beyond the initial headline opportunities and compares other factors you should take into account when deciding which site to play at. We also provide a brief history of online poker in the US to help explain how US online poker got to be where it is at the minute. Anybody looking at the current choice of options for playing real money online poker in the US could justifiably be very confused. There are dozens of opportunities available for players, but some are location-specific, others won´t accept players from certain jurisdictions, and a few limit the options for getting money into – and out from – an account. In this guide to US poker sites, we aim compare the pros and cons of each of the major US-facing operators to ultimately determine the best US poker site. To do this, we start with the generally available headline opportunities, and compare the secondary opportunities to arrive with an easy-to-compare conclusion. The headline opportunities offered by US poker sites are usually in the form of Welcome Packages. Depending on the site, Welcome Packages can consist of a bonus when you initially fund your account, some form of freeplay, and a free-to-enter poker tournament exclusively for new players. It is important to read the terms and conditions of each offer, because you may find there are time limits for taking advantage of the opportunities, or restrictions on how much you can withdraw if you win. It is also important to take into account when and how you will be able to take advantage of the opportunities on offer. You need other players to play against, so the popularity of each site and the level of traffic it attracts has to be a consideration. So do does the availability of a mobile app if you want to play poker on the go. The following table shows the average levels of traffic for the six US poker sites featured on PokerNewsReport and what they offer in the way of a mobile product. (1) Ignition Poker and Bovada Poker share player databases on the Pai Wang Luo Poker Network. (2) Americas Cardroom and Black Chip Poker share player databases on the Winning Poker Network. (3) BetOnline Poker is the flagship site on the Chico Poker Network. (4) Intertops Poker is the flagship site on the Horizon Poker Network. The six US poker sites recommended by PokerNewsReport all offer players Welcome Packages that include a first deposit bonus. Not only do the amounts of the bonuses differ significantly, but also how they are cleared. For example, the bonuses at Ignition Poker and Bovada Poker are cleared as certain milestones are reached, whereas the other four sites release portions of the bonus incrementally. Further information about clearing a poker bonus follows in the next section. Other differences between the poker bonuses include the length of time you have to clear them and the effective “rakeback rate” – the amount of money you have to pay in rake or tournament entry fees in order to clear the bonuses. The following table shows the percentage bonuses available, the maximum amount of each bonus (the minimum deposit to qualify for a bonus is $25.00), the number of days you have to clear the bonus and the rakeback rate based on clearing the maximum amount. (5) Due to the milestone method of releasing bonuses, the rakeback rate is higher the less you deposit. (6) In cash games, part of the rake deduction contributes towards the Beast rake race. (7) On Bad Beat Tables, part of the rake deduction contributes towards the Bad Beat Jackpot. (8) Approximation due to Intertops Poker distributing points according to the “dealt rake” method. In order to determine which the best poker bonus is for you, not only do you have to take into account the volume of players, mobile compatibility, the value of the bonus and how long you have to clear it, but also the way in which points are awarded and the rate at which the bonus is released. For example, although most US online poker sites now use the “Contributed Rake” method for distributing players´ points, Intertops uses the “Dealt Rake” method – which will suit you better if you are a tight player. With bonuses that clear using the “incremental method” (i.e. $10 of the bonus is released when you collect x player points), the rate at which the bonus is released is pretty easy to understand. However, the “milestone method” used by Ignition Poker and Bovada Poker is a little more complicated, as increments of your bonus are released in ever-increasing milestones. The table below helps illustrate this better, and more information can be found in our Ignition Poker and Bovada Poker reviews. Based on what has been discussed so far in our overview of US poker sites, we have compiled an Overall Rating for the Welcome Packages offered by our six featured sites. Points have been awarded according to relative volumes of traffic, mobile compatibility, and the first deposit bonus – taking into account areas such as the value, length of time to clear and rakeback rate. The “Other” figure relates to additional extras included by the sites in their Welcome Packages. Although first deposit bonuses can significantly benefit your bankroll, the amount of the bonus should not be the only thing you take into account when selecting which US poker sites to play at. The secondary opportunities described in the next section can be equally as valuable as first deposit bonuses (if not more so). Therefore, although BetOnline Poker may appear to be head and shoulders above the competition at this stage, read on to see if it maintains its position as best US poker site. (10) Americas Cardroom offers players a first depositors´ freeroll and 20 days free poker money. (11) Both Black Chip Poker and BetOnline Poker offer first depositor freerolls – BetOnline´s having the higher value. (12) Intertops Poker offers new players 100 free spins on its casino game of the week. Whereas the headline opportunities offered by US poker sites are generally short-term, the secondary opportunities are those we consider to be long-term. These include the choice of games offered by different US poker networks, the events and promotions each network hosts, and their VIP loyalty programs. Together these can add up to contribute a significant amount to your bankroll – or not. When looking at the games offered by US poker networks, what catches our eye is innovation and whether or not unusual formats of poker are gaining any traction at the tables. For example, Americas Cardroom´s Sit & Go 2.0 games are extremely innovative and popular. 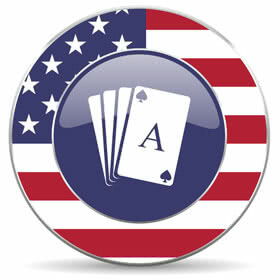 However, we have never seen anybody playing the BetOnline Poker´s 6-Max Americana or 32 Card Draw cash games. (13) Ranked by value and number. (14) Ranked by variety and popularity. (15) Ranked by stakes and popularity. (16) Ranked by maximum multiplier of buy-in. Every US online poker site hosts special events and promotions. These vary considerably and can range from million dollar guaranteed online tournaments to free-to-enter freeroll tournaments. Seasonal events can also influence US poker site promotions. For example, you will often find special reload bonuses coinciding with the Super Bowl, Independence Day or flagship tournament series. Being able to benefit from some of the promotions may mean spending a long time at the tables. For example, three of our featured sites host weekly leaderboard competitions in which the more you play, the more you are likely to win. Other promotions may include qualifiers for live poker events or massive cash prizes for being in the right place at the right time when a Bad Beat Jackpot (BBJ) is won. (17) Ranked by frequency and value. (18) Ranked by frequency and value. (19) Ranked by opportunities for low stakes players to benefit. (20) Ranked by prize value and distribution of prize money. The VIP Loyalty programs at Ignition Poker and Bovada Poker only give you access to freeroll tournaments and additional reload bonuses. There is no cash exchange. The VIP Loyalty programs at Americas Cardroom and Black Chip Poker include points-for-cash exchanges, milestone awards and higher level multipliers. The VIP Loyalty program at BetOnline is extremely modest inasmuch as the only things you can use player points for is to enter selected MTTs and Sit & Go games. The VIP Loyalty program at Intertops Poker is extremely versatile and allows you to exchange your points for cash, goodies from the online store or no deposit bonuses. Great for new players as the action at the tables is anonymized so you are protected from more experienced players. Not so great for valuable promotions and high-value tournaments. Not such a big bonus as Ignition Poker, but it does have an online sports betting portal that Ignition Poker lacks. Otherwise, shares the same pluses and minuses as Ignition Poker. Definitely the US poker site at which you are more likely to win a life-changing amount than any other. However, does attract top pro players because of this. Similar to Americas Cardroom in many respects, although usually behind with innovations and promotions. Doesn´t give the same “20 Days Free Poker” to new players. Certainly the best for a substantial first deposit bonus cleared at a very attractive rakeback rake. Offers the best mobile software, but little else to get excited about. Attractive to low stakes players in no hurry to clear their bonus or reap rewards from the VIP Loyalty scheme. Lack of players a concern and no Fast-Fold or Jackpot Poker. Obviously, there is no reason why you cannot have accounts at more than one US poker site. This would enable you to cherry pick which tournaments and promotions you wanted to take part in, while also giving you the option of one site´s online casino and another site´s sports betting portal. It also gives you the opportunity to take advantage of more than one first deposit bonus and all that free poker money. Although a number of text-based poker games were developed throughout the 1990s (IRC Poker being the most famous), the first real-money hand of online poker was dealt by Planet Poker in January 1998. Within a few years, many more operators saw the potential for online poker in the US and the volume of US poker sites increased substantially. Paradise Poker – the second site to launch – took advantage of Google´s pay-to-click advertising to temporarily become the most popular destination for online poker in the US; but, as Ultimate Bet, Party Poker and PokerStars launched, innovations such as first deposit bonuses attracted players away from the US poker sites that had been first to market. The introduction of online poker tournaments saw Party Poker become the largest US poker site. The site´s rise to the #1 position was helped by the Party Poker Million in 2002 being the first major live poker tournament to have online qualifiers. The following year, Chris Moneymaker won the WSOP Main Event after qualifying online at PokerStars, and the “online poker boom” was born. The “boom” is regarded by many as the Golden Years of Online Poker in the US and, from 2003 until 2011, US poker sites thrived. Although there had been a growing interest in the game due to action recorded at the World Poker Tour being broadcast on cable TV, the “Moneymaker Effect” inspired millions of people to start playing online poker in the US. According to the research site Statistica, more than 20 million people played online poker in the US by Spring 2008 despite the passage of the Unlawful Internet Gambling Enforcement Act (UIGEA) two years earlier. UIGEA resulted in many operators including Party Poker leaving the US market. The void was filled by PokerStars and Full Tilt Poker, who dueled for the #1 position over the next five years. The boom came to an abrupt end on 15th April 2011 when the US Department of Justice unsealed an indictment against PokerStars, Full Tilt Poker and Absolute Poker for violations of UIGEA. The dot.com domains of the three operators were seized and, although players from the rest of the world were subsequently allowed back onto the sites, US-based players were banned from real money games. The post boom years of online poker in the US have been as much shaped by events in the rest of the world as by domestic events. Although the DOJ´s opinion on the Wire Act (saying that it only applied to sports betting) opened the door for individual states to license Internet poker sites, progress towards a regulated environment has been painfully slow. By comparison, regulation across Europe and in other areas of the world has been relatively frenetic. Where regulation resulted in online poker players being ring-fenced within a national market, the lack of liquidity and limited opportunities drove many “Rest of the World” players towards US-facing networks – further increasing their levels of traffic and enabling them to host more valuable promotions. The valuable promotions led to players from “open jurisdictions” being attracted to better first deposit bonuses than they could find on the .com platforms and tournaments with life-changing prize money. This has resulted in an inaccurate perception of how many US-based players are actually playing on US poker sites, as a large proportion of the sites´ databases originates from outside the US. The early days of online poker in the US were not without their problems. Planet Poker´s ropey software and inadequate backend resulted in multiple outages and a security incident in which hackers breached the site´s servers and were able to see community cards in advance. It was also a time when players were subject to poor connections due to dial-up Internet access. During a period known as the “Wild West of Internet Poker” sites launched and disappeared overnight. Some were simply unable to remain financially viable due to loss-leading promotions. Others suffered from poor management or fraud. In many cases players´ had their funds returned, but not all. Indeed some are still waiting for their funds to be returned from the closure of Absolute Poker in 2011. However, outages, scandals and other issues were not exclusive to the early days of online poker in the US. During the boom years, players at Absolute Poker and Ultimate Bet had been victims of insider cheating, while Black Friday exposed the massive mismanagement of player funds at Full Tilt Poker. Unfortunately, these were not the end of the issues affecting online poker in the US. Cake Poker – Cake Poker launched in the height of the online poker boom and, for a while, was one of the leading US poker sites. The site closed in 2016 after encountering payment processing issues, with players and their balances transferred to other sites on the Horizon Poker Network. Everleaf Gaming – In February 2012, the US Dept. of Homeland Security seized the funds of a payment processor for the Everleaf Gaming Network. The Network never recovered and closed the following year, with two former executives subsequently arrested for the misappropriation of players´ funds. Full Flush Poker – Full Flush Poker was the flagship skin on the Equity Poker Network – a network that set out to change the way networks operate by implementing a co-operative model. Unfortunately the co-operative model was mismanaged and the site disappear in 2016 with players´ balances. Live Ace Poker – Live Ace Poker was a subscription-only network serving thirty-one states in the US. Players could only use their winnings to bid in auctions and, due to the limited opportunities to bid on anything worthwhile, the site closed in December 2013 after only four months of operation. Lock Poker – Lock Poker is the most notorious rogue site in the history of online poker in the US. After initially looking like a legitimate site, outrageous promotions were offered to attract deposits that would then be used to pay withdrawals. The site disappeared in 2014 owing players more than $1 million. World Poker Exchange – The World Poker Exchange was a poker room operated by the long-standing World Sports Exchange until 2012; when, unable to control unprecedented levels of collusion, the site closed. Players were never paid and the sports book subsequently closed the following year.